Sunset view of Black Butte from the Everitt Memorial Highway. As you drive north on Interstate 5 just west of Mount Shasta City, drivers are treated to a dramatic, head-on perspective of conical Black Butte. This dusky pyramid draws attention from every driver for a few minutes as they seem to be driving right into the base of the peak. Eventually, the looming bulk of Mount Shasta assumes command of the entire scene and Black Butte becomes almost an afterthought of the giant that rises to the east. It simply pales in comparison to the famous volcano. The same phenomenon takes place when hiking in the Trinity Divide, where epic views of Mount Shasta overwhelm Black Butte and relegate to the status of a subject lying at the foot of its sovereign. Overlooked in favor of the incomparable Mount Shasta, Black Butte is often left hiding in plain sight. Mount Shasta looms behind Black Butte. 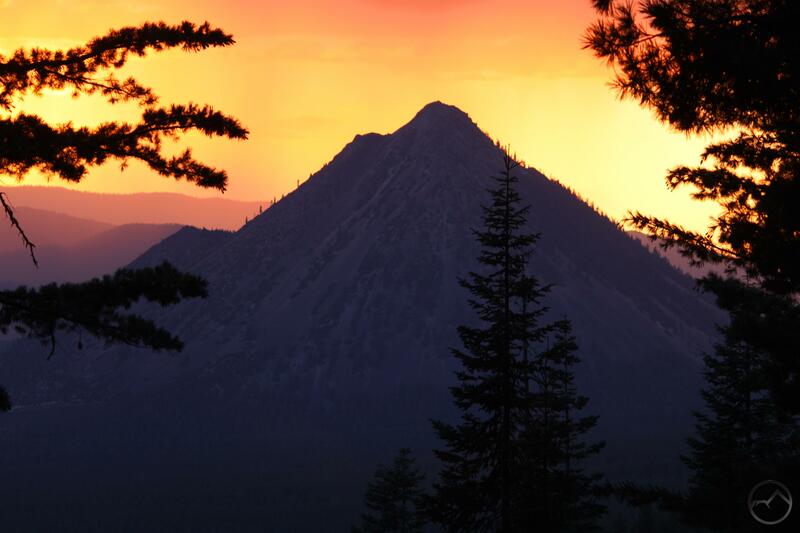 Fortunately, Black Butte remains a striking mountain, compelling in its own beauty and stature. Thrusting up suddenly from the top of a saddle that connects the Klamath Mountains and the Cascades, it is prominently visible from throughout much of central Siskiyou County, whether at the far northern end of the Shasta Valley or from the southern peaks of the Trinity Divide. In the populated areas of southern Siskiyou County, Black Butte is a nearly omnipresent sight. From the south, the mountain is a triangular tower with steep sides culminating in a needle like summit. The mountain presents a somewhat different appearance from the north, with its various eruptive stages more evident and the summit appearing like a small turret shunted off to the side of a more rounded top. Looking north past the hidden valley on Black Butte. The westernmost outlier of the Cascades in California, Black Butte’s very appearance indicates its volcanic origin. It is composed primarily of andesite, the same dense volcanic rock that composes much of Mount Shasta. Like Mount Shasta, Black Butte is the result of several eruptive stages. At least five separate events have produced the mountain’s current configuration. 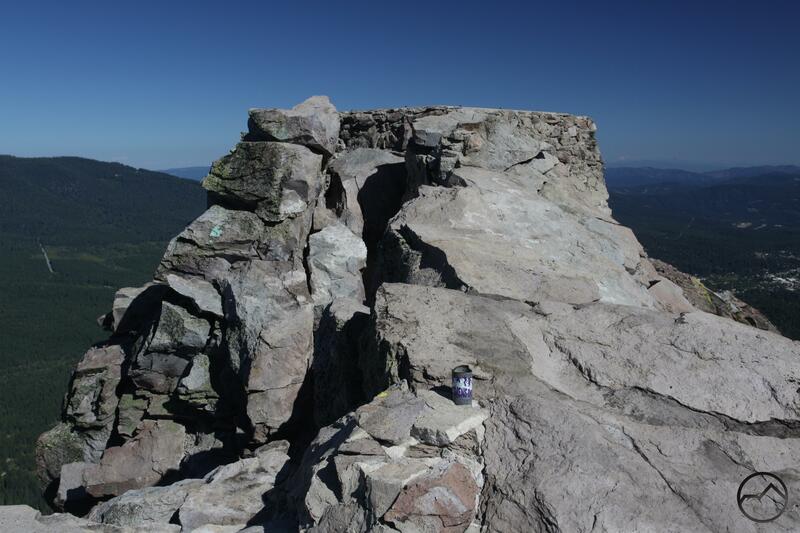 Each eruptive stage results in one of Black Butte’s prominent rocky turrets, including the summit. The exception to this is the large ridge on the north side of the mountain. Though this is likely the product of similar formative events that brought about the other peaks, this one formed into a broad crest rather than a sharp point. While hiking the trail to the summit, this long ridge almost seems like a portion of an old crater rim. Though this is unlikely, it certainly is not something that cannot be ruled out. 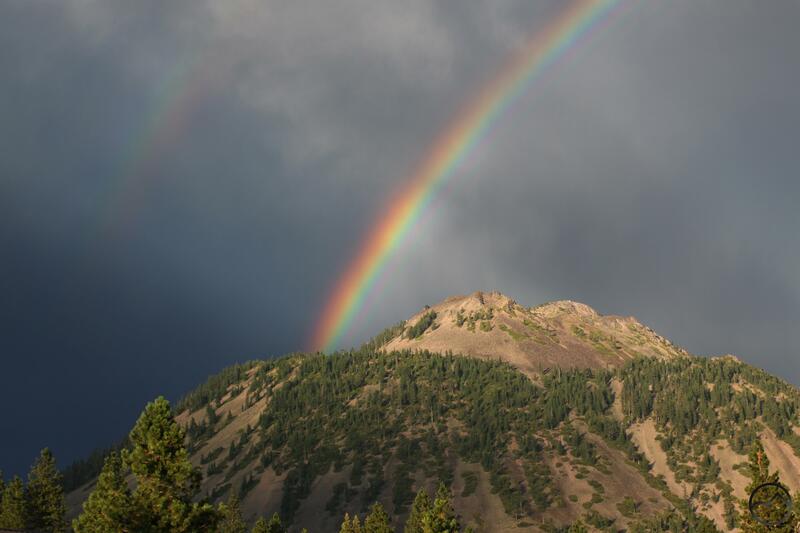 Rainbows contrast against dark skies above Black Butte. Despite its proximity to Mount Shasta, Black Butte is formed by distinctly different process than its monumental neighbor. Indeed, it is a good example of a plug dome volcano. This time of formation is built up through the slow extrusion of extremely viscous lava. Each successive eruption covers earlier lava flows. When the lava cools it hardens and then fractures, which has resulted in the mountain’s appearance as something akin to a giant pile of rubble. In truth, this is the broken up flow that flowed down its steep sides. 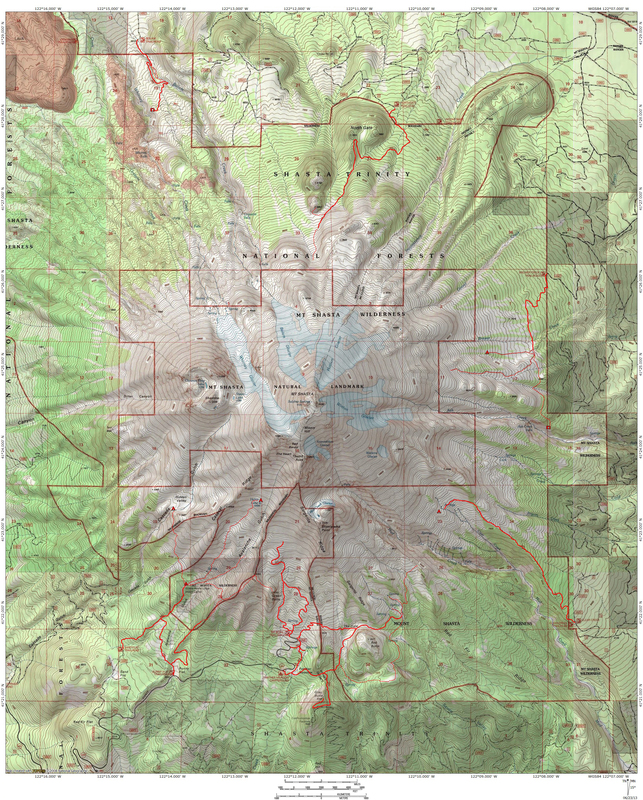 It is worth noting that Lassen Peak, 75 miles to the southeast, is the largest plug dome volcano in the world. The peak is situated on top of Black Butte summit, one of the highest passes crossed by Interstate 5. Though it is not an exceptionally high pass, it is the high point that connects Mount Shasta and Mount Eddy, two ultra-prominence peaks. Mount Eddy towers just over 5,000 feet above the pass while Mount Shasta looms a spectacular 10,000 feet overhead. The saddle between the two large mountains sees intense weather as storm systems unleash their full fury on this narrow pathway. Black Butte sits in the midst of this maelstrom and can see extremely harsh conditions. 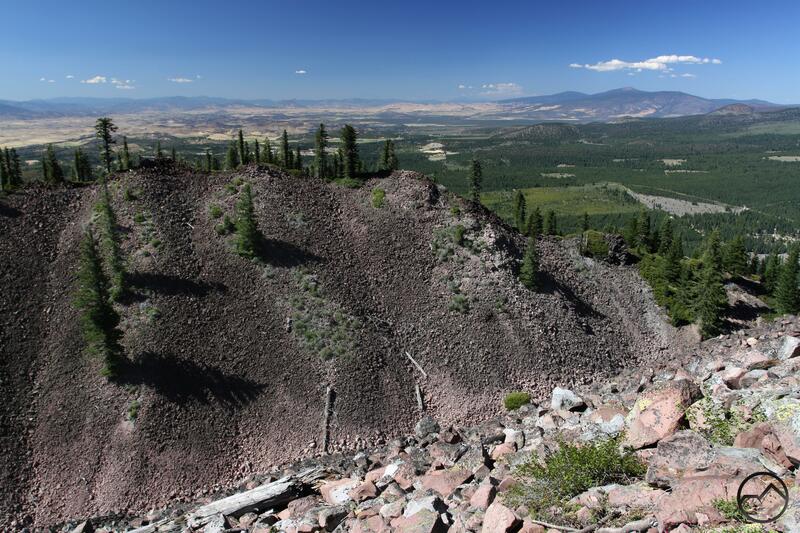 Black Butte has been a prominent landmark in southern Siskiyou County for almost 150 years. It seems that the name Black Butte was applied to the peak fairly early in the settlement of the area, though it was by no means the only moniker that has been associated with the mountain. Perhaps the most interesting name it has had was Muir’s Peak. The name is no doubt given to the peak in honor of John Muir, the preeminent conservationist of the 19th century. 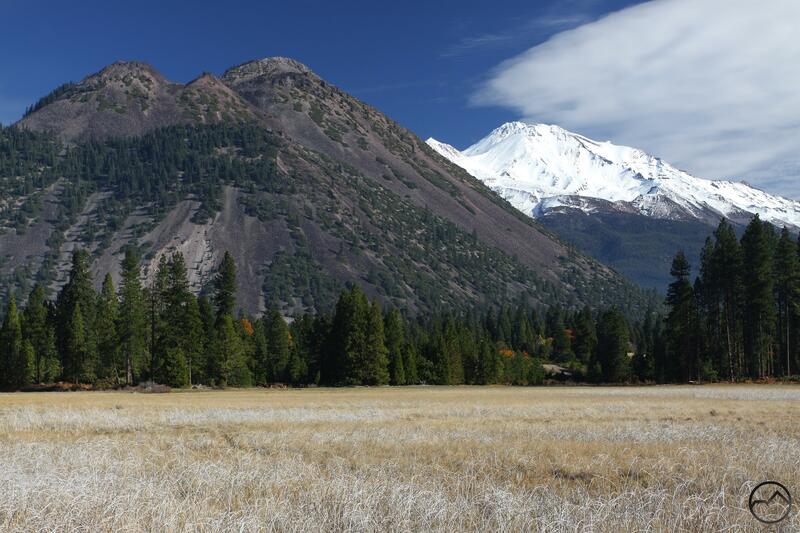 It is not a surprise that something in the Mount Shasta area would bear Muir’s name, given his long association with and love for Mount Shasta. He advocated strongly for a large national park centered on the great volcano and Black Butte would in all likelihood have been included in the park. If fate had been a little different, the hike to the top of “Muir’s Peak” could have been a classic national park adventure rather than a popular trail with local hikers. Vintage images of Black Butte. Note the stereograph identifies it as “Muir’s Peak”. Though the tribute to John Muir was fairly well known in the first half of the 20th century, it seems to have faded in popularity in favor of the color-themed moniker. While the association with Muir would have been nice to broadcast via the peak’s name, there is a certain symmetry in naming notable peaks around Mount Shasta with color-related names. Currently there are five such peaks: Black, Yellow, Gray, Green and Red Buttes. Three are located high on the southern flank of Mount Shasta, one on the mountain’s north side at the edge of the Shasta Valley, and Black Butte, which sits astride the pass that connects the mountain to Mount Eddy and the Klamath Mountains. There are a few nameless but notable peaks that could be added to this group. Lookout foundation on the summit. One of the more interesting chapters in Black Butte’s history was the presence of a fire-lookout that was built on its summit. This must have been the most precarious and spectacularly situated lookout ever in the U.S. With sheer drops on all sides and phenomenal 360 degree view, it is easy to imagine how magnificent this post must have been…until one considers the winds and lightning storms. Built in the 1930’s, the tower was ultimately removed in 1975 by helicopter. The concrete foundation is still present on the summit. Most recreation on Black Butte involves hiking up the Black Butte Trail. Though it is steep and rocky in a few places, this is nonetheless a classic Mount Shasta area hike. The trail makes a series of long, sweeping switchbacks up the north side of the mountain, with great views nearly every step of the way. Aside from the great vistas and the memorable summit panorama, one of the most interesting features of the hike is the surprising presence of a valley on the north side of the mountain. The valley is created by the long, crest-like ridge formed from an early eruption of Black Butte. From down below, it seems almost inconceivable that a valley could exist on such a steep-sided peak. 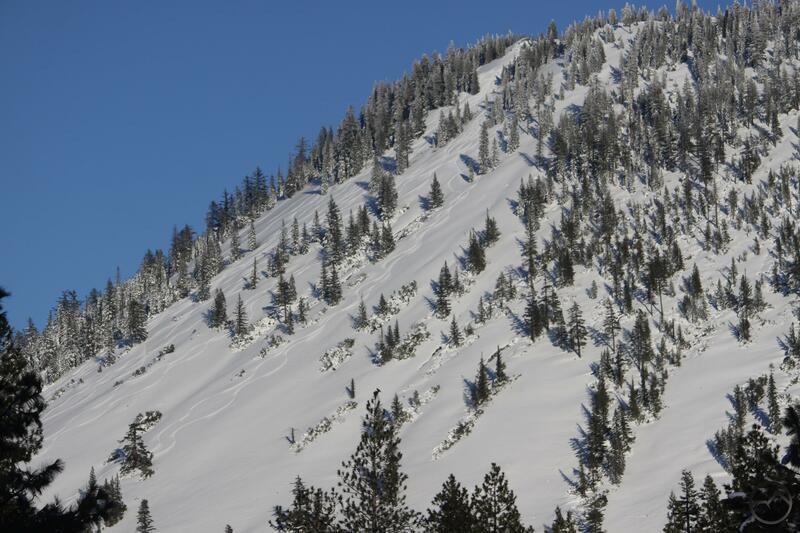 In addition to hikers, Black Butte has been known to be skied by intrepid backcountry aficionados. Phoenix rises over Black Butte at sunrise. Mount Shasta and Black Butte from the west. The hidden valley on the north side of Black Butte. Lookout tower foundation on the summit. Summit view of Mount Shasta. This is the second in a new series of posts that will highlight the peaks and mountains around Mount Shasta. This started last year with a stand alone post on Mount Eddy. At the time, I had not envisioned a whole series on the various peaks but now that seems like a worthy subject to explore further. It is my hope that this new series will prove interesting and helpful. Simply stunning and thoroughly enjoyed reading this. Thank you for sharing. Black butte is a stunning sight to drive past and we were lucky to admire it several times. I had assigned to this post the tag “read when I have more time.” Ha! There are many pages with that tag in my bookmarks, but today, more than a year later, yours won the lottery! I love reading about Black Butte! I wonder if any of the lookout people posted up there ever wrote a journal or notes or anything? That would indeed be a scary/thrilling place from which to take the wide view all day long.